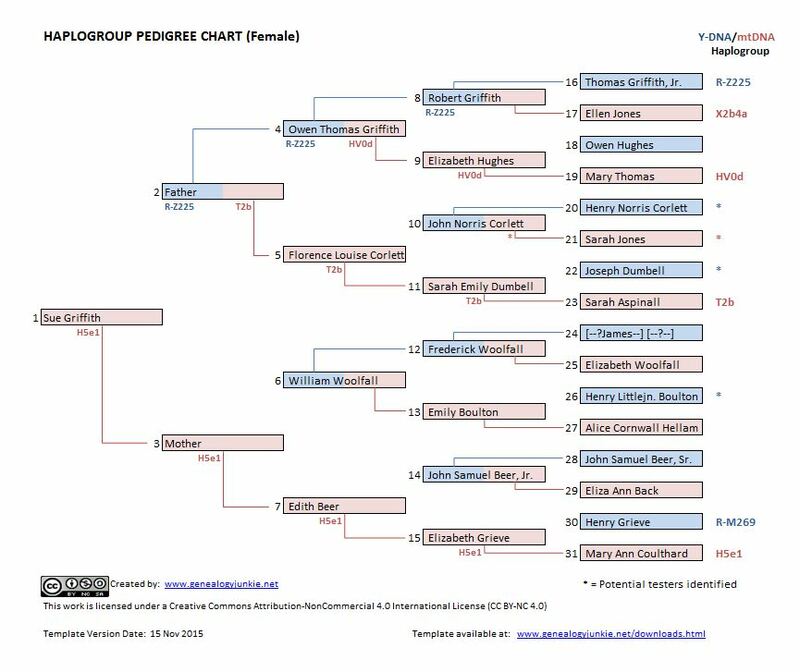 In 2014, I wrote a blog posting about creating a Haplogroup Pedigree Chart (blog posting) and as well as creating my own Haplogroup Pedigree Chart, I created a template for this, available on the Downloads tab, which incorporates templates for both males and females as the "root" person on the tree. Since that blog posting, additional cousins have been tested and I now have 6 branches filled (of 16 through to my 2nd great-grandparents) – and know the Y-DNA haplogroups of 7 ancestral lines and the mitochondrial haplogroups of 4 ancestral lines. In addition, my father has been tested with Family Tree DNA's "Big Y" and so his (almost) terminal SNP is known. The tree below is the updated version since the blog posting.